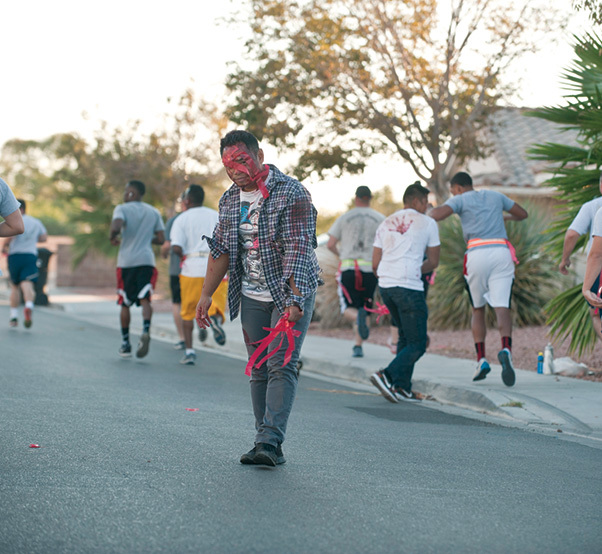 A volunteer role-playing as a zombie walks toward participants in the National Preparedness Month Zombie 5K run at Nellis Air Force Base, Nev., Sept. 25. Participants in the run embarked on the standard base 5K route wearing a reflective belt which carried three survey tape flags that were used as “lives” and encountered numerous “contaminated areas” where they had to outsmart and outrun zombies seeking to take their “lives”. Participants could also earn extra lives by showing that they have a disaster kit or an emergency plan in place.